Pre-calibrated vertical (elevation) adjustment knobs or dials have been in use for about 100 years. The problem is that at the longer ranges, it is not practical to provide dials to cover a large variety of calibers. It is further compounded by other factors such as different bullets, barrel lengths, etc. Although Leatherwood's Camputer Model 1000 ART scope opened up whole new dimensions to the world of long range shooting, there are many precision long range shooters who still want to use a conventional style scope. In the past there were two options for long range shooting: shoot a specific load or tape a chart of computes to the rifle stock. The Uni-Dial™ designed to solve the problem. By using a series of ten moveable indicators or flags, the shooter can set the range zero points him or her self. The dial is calibrated in minutes so that the flags can be set according to the ballistic data. Once set, the flags are locked in place and the dial is operated in a conventional manner. The vertical dial has a 0.5 minute click adjustment and the windage knob has 0.25 minute clicks. Both adjustments have a tope to prevent the shooter from getting lost as to where his or her zero is. But both adjustments can be unlocked from the stops to permit zeroing. The flags are numbered from 1 to 10. All allow the shooter to pre-program elevation and windage for up to ten different ranges, or with different loads – and each can be locked in place and returned to within seconds. The total minutes of elevation change is about 60 MOA. There are about 20 minutes for initial zeroing. One full-turn for the change of elevation is 40 MOA. The Uni-Dial™ scopes now have all improved with a wider range of variable magnifications. The 4-16 ATR The Uni-Dial™ series feature the Top-Angle focus. The 2.5-10 The Uni-Dial™ scope is made with a 1″ tube. 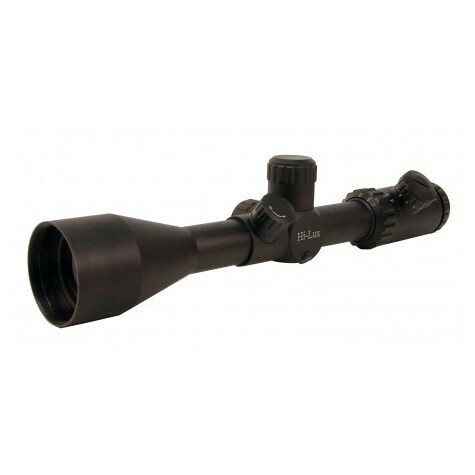 This scope is designed for those people who already have the 1″ rings and just want to replace the scope. With the new All Terrain Design, the 2.5-10 The Uni-Dial™ becomes the brightest 1″ diameter scope available today. All the Uni-Dial scopes come with a 4 1/2″ extended sunshade.